Home Jim Rutherford Mario Lemieux Pierre McGuire Pittsburgh Penguins Ray Shero Pittsburgh Penguins GM Update: What In the Hell Are They Doing? Pittsburgh Penguins GM Update: What In the Hell Are They Doing? The Pittsburgh Penguins announced the firing of then general manager Ray Shero on May 16th, 2014. 18 days later the Penguins have yet to give any real indication of who the new general manager will be. As if the torture of not knowing who the next gm will be isn't enough, the fans have also been tortured with relentless rumors and stories of Pierre McGuire being a real candidate for the job. The question is, what in the Hell are the Penguins doing? 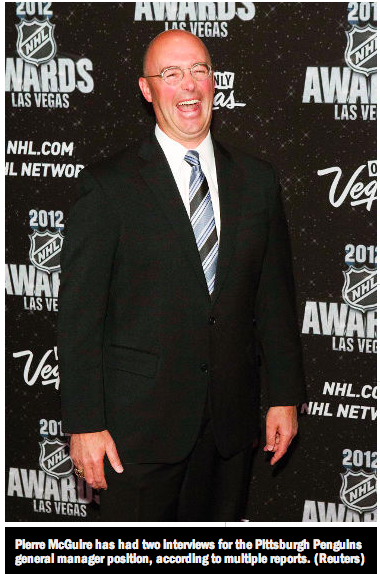 McGuire, a TV analyst for NBC has a great hockey mind, there is no doubt about his knowledge of the game of hockey. Perhaps no other person on earth knows as many people or as much trivia when it comes to the game of hockey. That being said, the last time McGuire held a job in the front office of an NHL team was 1996, almost 20 years ago. As for McGuire's resume, he has never been an NHL general manager and has just one year as an assistant gm under his belt. McGuire has also been an assistant head coach and an NHL scout during his very short stints in the NHL. For some reason, the Penguins seem very serious about giving McGuire a shot. I think that would be a big mistake. Considering the team just fired Shero, which did shock some people around the league, you would think a team that is trying to overcome playoff disappointments would hire someone with a more solid background than McGuire. However, keep in mind that David Morehouse is now a primary decision maker when it comes to these kinds of hockey decisions, and that is not a good thing for Penguins' fans. Hopefully, the McGuire interviews are a smoke-screen of some sort. Talking to others, perhaps the Penguins are just interviewing as many people as possible to get as much outside information and views on their current roster as possible. That being said, I think replacing Shero as general manager with McGuire would go down as the single biggest mistake in Pittsburgh Penguins' history. Remember folks, McGuire has not worked in the front-office in the NHL since 1996 and had never worked with a salary cap. To top off the insane McGuire-for-gm possibility, the Pens have announced that former Carolina Hurricanes' general manager Jim Rutherford is being considered as well. Why? Rutherford just stepped down as the gm in Carolina after making terrible decision after terrible decision. Yes, hire the guy that traded Brandon Sutter, Brian Dumoulin, and a first-round pick (Which ended up being Derrick Pouliot). Rutherford then traded Jussi Jokinen to the Pens for a conditional draft pick, as well as retaining half of Jokinen's salary. It gets better, and Rutherford has screwed up Carolina's salary cap so bad for the next few years, locking up almost $50 million in just 10 players through 2016, a list of players that include Jordan and Erik Staal, Alexender Semin, and Cam Ward. Yeah, a big no thanks to Rutherford as a possible candidate for the Penguins. McGuire and Rutherford are jokes as candidates. I seriously would have to question what the Penguins front-office is thinking if they hire either one of them. The fact that they are even mentioned is ludicrous. At this point they should just start having fans enter contests to be the next gm, if you're going to make it a circus, make it the biggest circus ever. As for who should be the next gm? Well my opinion really doesn't matter, but I think the best candidates are Jason Botrril and Lightning Assistant GM Julien Brisebois. Brisebois young rising star in the NHL after serving the last four seasons under Steve Yzerman. Brisebois has been involved with all aspects of the hockey operations by negotiating contracts, advising Yzerman on player personnel decisions, salary cap management, and serves as the team's GM for the AHL affiliate Syracuse Crunch. was the Assistant General Manager under Shero for five years. Prior to this change, Botterill was responsible for scouting, player development, contract negotiations, managed Hockey Operations, and GM for the AHL affiliate Wilkes-Barre Scranton Penguins. Lastly, shouldn't the Penguins hurry up and make a decision pretty soon? I mean, the NHL draft is June 27th and free-agency starts July 1st. On top of that, the new gm will most likely fire Dan Bylsma, which will result in a hiring process for a new head coach plus the coaches' staff. For the first time in my life I am seriously questioning what the Hell Mario Lemieux and the Pittsburgh Penguins are doing. Waiting for someone from CHI, LAK or NYR organizations?